Our internationally respected Recommended Procedures and Publications are a core activity of the BSA. The documents and information on this page, except those awaiting review, are the responsibility of the Professional Guidance Group. Comments on these documents and this page are welcomed and should be sent to marked for the attention of the Chair of the PGG. 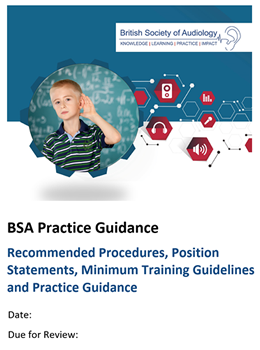 Although care has been taken in preparing the information supplied by the British Society of Audiology, the BSA cannot guarantee the interpretation and application of it. The BSA cannot be held responsible for any errors or omissions and accepts no liability whatsoever for any loss or damage howsoever arising. Did you know you can access these resources simply by logging in with your BSA username & password?